This 24-hour all-inclusive hotel has undergone a complete renovation and features endless fun for the entire family, including free entrance to the thrilling SPLASH WATER WORLD aquatic funplex. Located on a spectacular stretch of white-sand beach, this property features 676 guestrooms, all Riu's distinctive amenities. The hotel offers an American breakfast buffet, room service 24-hour all-inclusive (snacks and beverages) feature six restaurants. Guests enjoy “stay at one, play at three” privileges with sister hotels Riu Bambu and Riu Naiboa. Children have their own pool as well as a mini-club program. 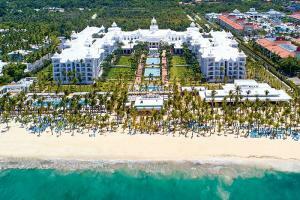 Located on Arena Gorda Beach in Punta Cana, 19 miles from Punta Cana International Airport.